Hello, all! Time goes by so fast! Its the 14th of the month again (and by the time I’m finishing up this post is 15th, crazy! ), time to introduce the new Simon Says Stamp Kit of the month! Once again perfect for Fall. I’ve already made several cards and I’m excited to share those with you over the next coupe of days. The first card I made was a very simple one with several stamped and watercolored leaves. I’m yet once again fascinated by watercolor and I’m trying to use it as often as I possibly can. I started by heat embossing several leaf outlines onto watercolor paper using Brass embossing powder from Hero Arts. I colored the leaves using yellows and reds from my watercolor set and cut the images out with my scissors. 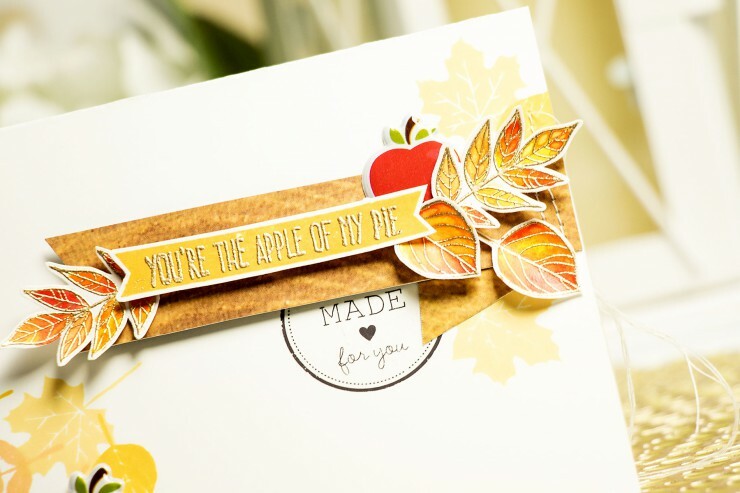 I stamped several solid leaves onto a card base using Duckling, Sunshine and Melon, added a Made for You rub on in brown and created a layered sentiment banner to put on top. 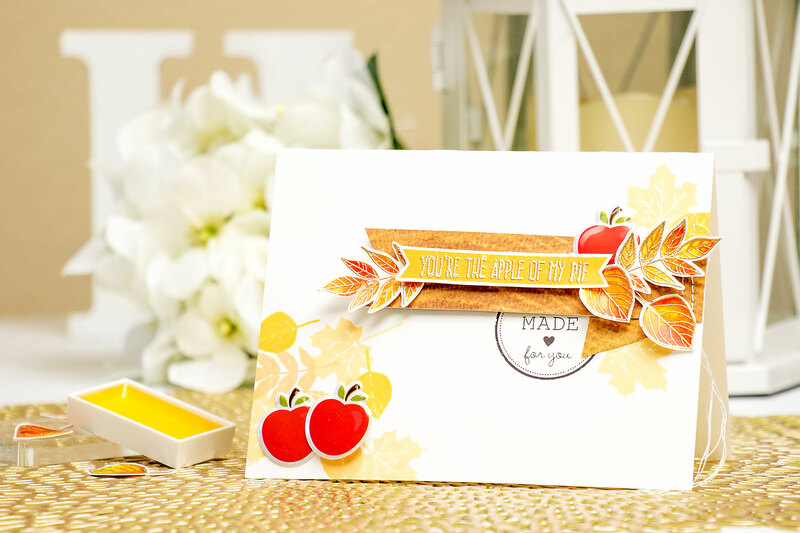 I added several apples to my card by using Puffy Apple stickers from my kit. Like this video? Give it a thumbs up and share with friends. Thanks! Nice card Yana. I enjoy your suggestions to use different kinds of media to pull the card together. Thanks. thank you, Jody! I’m glad you enjoyed it! Gorgeous, gorgeous! Such an organic feel, perfect for the season! Great card, lovely design and colours. Amazing! So fresh and clean! Love how bright fall colors look on white background! thank you so much, Svitlana! I’m so happy you like it! I’m not a big commenter because I’m usually doing dishes while I watch card videos! God has blessed you with such talent! This card and all the others I’ve watch are beautiful! You always have fresh way of using the supplies and I enjoy watching your process. Thank you for sharing with us! thank you so much for your sweet comment, Noelle! much appreciated! hugs!